Circlet Headdress hand made by a true Celtic Welsh Lad. These beautiful Circlets, Alter Pentacles and Book of Shadows are handmade by Starlight. Perfect for the priest or priestess of any coven! Wicca supplies, pagan jewelry, Wicca jewelry, Celtic jewelry, Goddess jewelry, witchcraft supplies, new age, occult, retail supplies store featuring sterling silver jewelry, books, magick, magic, ritual items, divination and more..
www.witchcrafter.com for all your Wicca supplies, pagan jewelry, Wicca jewelry, Celtic jewelry, Goddess jewelry, witchcraft supplies, new age, occult, retail supplies store featuring sterling silver jewelry, books, magick, magic, ritual items, divination and more..
Hand Made Writing Journals, Book of Shadows, Custom made Inserts available, A must to see! Hand made Sterling Silver Circlets and Headpieces. My name is Alan and I am a true Welsh Lad from Brymbo situated high up in the Welsh Mountains of Wales. I hand create all you see and born them into this universe unique. I am a solitary practitioner and you will feel the positive energy in all I create. Silver has been used since ancient times as the favored metal for amulets and Magickal jewelry and is said to enhance psychic abilities. 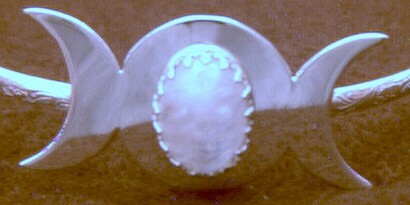 Silver is considered to be representative of the Goddess and the moon. In Alchemy, the symbol of silver is a crescent moon and called Luna or Diana after the Roman goddess of the moon. 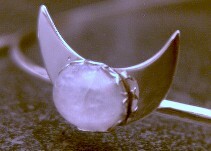 Long associated with Magickal ritual Silver is an excellent conductor of electromagnetic energy. Moon, symbolic of Goddess / female divine energy. Lunar force represents light within darkness and enlightenment from ignorance. The Moon is associated with intuition, Magick and mystery and is a symbol of the powers of flow, psychic perception, receptivity, and the unconscious. The Three Mothers, or Triple Goddess, were known around the world. The Triple Goddess represented the three stages of human life: youth and puberty, parenthood and maturity, old age and wisdom; or body, mind and spirit. This triad symbolized the three phases of the moon: Crescent, Full and Dark. The Goddesses were most often known by the titles of Maid, Mother and Crone. These beautiful Circlets are handmade by me in Sterling Silver. They come complete with a 7" adjustable chain and will fit virtually any size head. 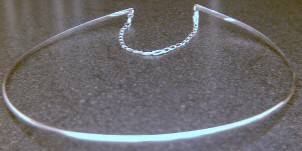 The headband is made of Sterling Silver (10 gauge 1/2 round), wire; the Crescent & Full Moon are the size of a quarter. The adjustable chain insures that it will stay put! These are highly polished to a mirror finish. Perfect for the Priest or Priestess of any coven!